I see that You are not so much philosophizing as (if it is permissible to speak thus) Theologizing; for you are recording your thoughts about Angels, prophecy and miracles. But perhaps you are doing this Philosophically. However that may be, I am sure that the work will be worthy of you and something I shall want very much to see. Since these very difficult times stand in the way of freedom of communication, I ask you at least not to be reluctant to indicate to me in your next letter what your plan and aim are in this writing of yours. 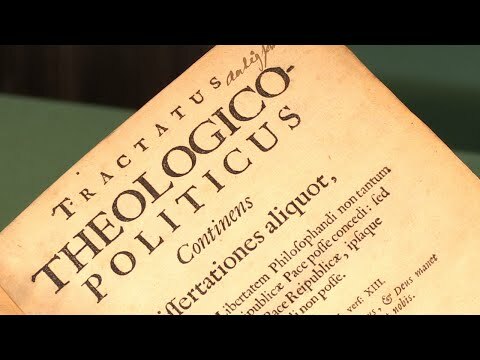 In Tractatus theologico-politicus, Spinoza critically analyses and demystifies several notions of revealed religion. He also downgrades and ruins the traditional Protestant theocratic doctrine on the historicity of the Old Testament—the Pentateuch’s Mosaicity in particular—by merely contending that all of its texts were written and revised by the eminent author-editor priest Ezra, a stand referred to as the so-called Ezran theory. That ground-breaking hypothesis, which struck the core of Christian mainstream argumentation, firmly holds that every line of the Pentateuch as well as of the prophetical books was not composed by Moses or its reported historians, but was indeed written and restored by Ezra the Scribe after the Babylonian Capitivity long after the prophet’s death. In his unyielding scientific analysis, Spinoza further cogently points to the haphazardness of the entire text corpus of Holy Scripture. Moreover, he also construed in the treatise that Holy Writ did not contain any speculative, revealed theological mysteries nor tenets of faith, but just a series of moral lessons in piety (a source of guidance). Determinedly, Spinoza classifies biblical texts in the Old Testament as mundane and spoiled digests which he assumes to have been compiled many centuries after the age in which the narrated events had allegedly taken place. Contrariwise, he particularly stresses the importance of embarking upon a philological examination of scriptural texts, just like also the medieval Jewish commentator Abraham Ibn Ezra had done before him. Moreover, his treatise sceptically debunks the possibility of supernatural phenomena by replacing them with pure rational explanations. Spinoza also dismisses prophetic knowledge, Jewish law, the election of the Jewish people and the God of Abraham, all on the basis of profound scientific analysis and intellectual discourse of the method of nature. Evidently, for Spinoza is it plain that there is no internal evidence operating in the Bible making it plausible that it contains the revealed word of the traditional Judaeo-Christian God. For him, firstly, knowledge of Scripture came from Scripture alone (sola scriptura) and natural philosophy could not be employed to scriptural exegesis as such. Secondly, the Bible, according to Spinoza, was only to be understood by ‘the natural light’ (common reasoning). The ‘true’ first text edition the ‘Theological-Political Treatise’, i.e., T.1, supposedly issued by the Hamburg bookseller/publisher ‘Künraht’—the octavo text edition T.3 has one ‘Kunraht’ (T.3e) and T.4/T.5 have ‘Künrath’—in 1670, was laid up four times in the quarto format (T.2/T.2a, T.4n/T.4 and T.5). Virtually certain, these were all produced by the Amsterdam printer Israel Abrahamsz de Paull (Jagersma and Dijkstra, 2013). Graesse, 1859-67, vol. 6, pp. 469–70; Van der Linde, 1871, p. 2, no. 3; Land, 1882 (A), mainly on text corruption; Catalogue, no. 150 (Wolf), pp. 32–3, nos 361–3; Bamberger, 1961, p. 15 (T.1); Catalogus, 1965, p. 37, no. 162; Kingma and Offenberg, p. 8, no. 3. For an introduction to the bibliographical features of the T.1 variant, see video.